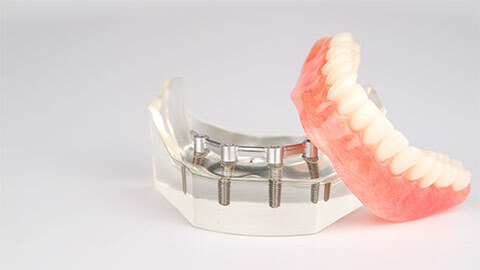 Dental implants are the best permanent solution for missing teeth. They can be used to replace a single tooth with a crown, or they can replace several teeth with an implant-supported bridge or denture. Implants are not only a great permanent aesthetic solution for missing teeth, but they also provide support and structure to your bone tissue, preventing bone loss. The dental implant process is simple. A dental implant is an artificial root that is placed in the bones of your jaw. Once it is placed, the bone tissue fuses to the implant, strengthening it and providing a solid foundation for a replacement tooth. Implants are placed in a surgical procedure. 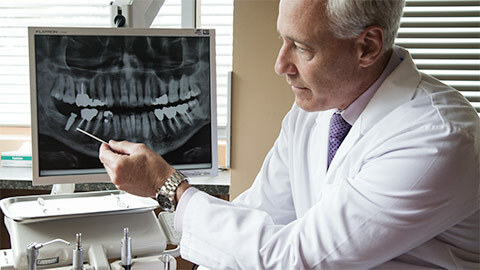 Before we place the implant, we use X-rays and other imaging technologies to pick an ideal location. During this stage we also determine whether your bone tissue needs to be built up to support the implant. Once we find a location, we drill a small hole into your bone tissue and place the implant. Then we close the area with sutures and you go home to heal. While you are healing, your bone tissue begins fusing to the implant. When this process is complete you return to our office to have your restoration placed on the implant. On your final visit the dental restoration is designed in our office and attached to your implant. Implants need the same care as natural teeth. Brushing and flossing will help prevent gum disease and regular examinations will ensure your implant remains healthy and secure. If you’d like to learn more about dental implants, or to book a consultation with us, call 228-875-3343 today.